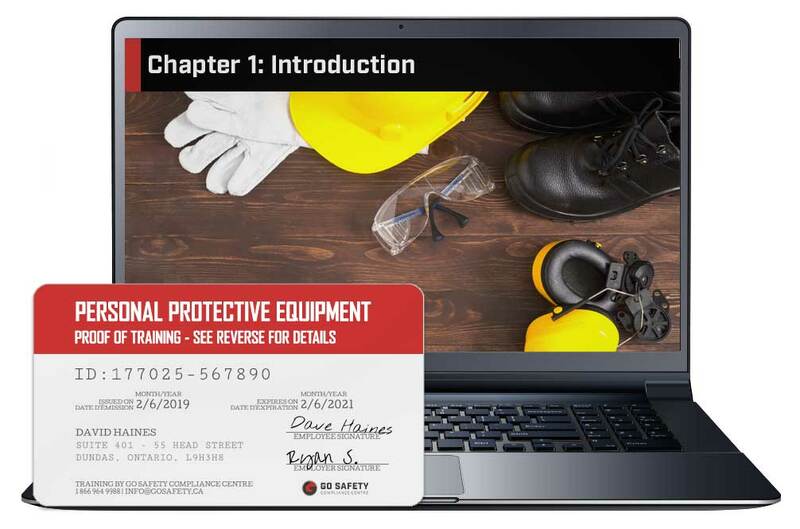 This Online Personal Protective Equipment (PPE) Course will guide you through all aspects of PPE, from upper and lower body protection to respirators and helmets. Additionally, the course will discuss CSA standards and maintenance regimens. PPE safety training is required by many industries and you should check with your employer to see whether you need to be trained on specific equipment. Chris N. Verified Buyer Great way to take online coarse , well satisfied with this program!! Oluwatoyin A. Verified Buyer Fantastic training experience. I will definitely recommend it to more people. Keelin D Verified Buyer Very good training videos are detailed and easy to follow. Tammy R. Verified Buyer It is easy to follow, on point, and we can do the training on our time. Training can be completed in four to five hours. Work at your own pace with no time limit. 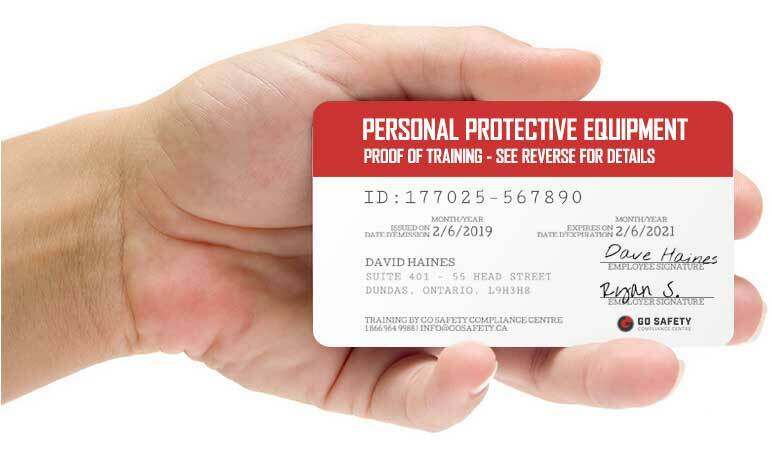 A sturdy plastic Personal Protective Equipment Training wallet card may also be ordered directly from your Go Safety account for an additional fee. These hard-copy certificates are printed on durable 0.30mm polycarbonate plastic. WHO NEEDS PERSONAL PROTECTIVE EQUIPMENT TRAINING? Most industries have adopted some form of PPE. It is important that you are trained in the theoretical and practical use of each article that you are required to wear. Check with your employer to make sure you have received adequate training before starting work. WHAT TOPICS ARE COVERED IN THE PPE SAFETY TRAINING COURSE? What constitutes personal protective equipment. Protective clothing, helmets & footwear. High Visibility Safety Apparel (HVSA) requirements. The need for safety goggles and hearing protection. Risk assessment and hazard control. Depending on the nature of your work, additional training may be required specific to your job and safety standards within your industry. This may include additional practical training for the specific type of PPE. Training is typically provided by the employer and must be delivered by a competent and qualified person. Check with your employer before you begin work to make sure you are adequately trained. HOW LONG WILL IT TAKE FOR ME TO COMPLETE PPE SAFETY TRAINING? Most students complete the course in a little over four hours, but there is no time limit. You can pause the program and pick up where you left off later. Once completed, the training material will continue to be accessible to you for review purposes. You can write the exam multiple times until you achieve the passing grade of 80%. WILL THE ONLINE PERSONAL PROTECTIVE EQUIPMENT SAFETY TRAINING COURSE WORK ON MY TABLET OR SMARTPHONE? HOW CAN I ACCESS MY PPE SAFETY RECORD OF TRAINING? WHAT HAPPENS IF I LOSE MY PERSONAL PROTECTIVE EQUIPMENT SAFETY TRAINING CERTIFICATE? CAN I PURCHASE THE ONLINE PPE SAFETY TRAINING COURSE FOR SOMEONE ELSE?